I did my first ethnographic field research in Vizag on the South Asian social custom of dowry and took Telugu literature classes at Andhra University, getting up every morning at 6 am to study Hindi with a high school teacher who lived a few doors down from me across the street. She tutored little kids in English while she taught me Hindi. We’d sit on a wooden bench in her parlor drinking steaming chai made with water buffalo milk and in between gossiping in Telugu, I’d read from a children’s Hindi Primer reciting sentences like “See the red mango Mohan? Bring me the red mango,” while a gang of little kids sat beneath us, at our feet. “See Anil play cricket?” they read from their English Primer while I read about Mohan in Hindi. “Anil meets Mummy for tea.” Whenever one of the little kids would stop reciting and become distracted or fall asleep my Hindi Teacher would whack them on the side of their head with whatever she happened to have in her hand at the time, a dish cloth, a piece of her sari, and without so much as looking the offending student’s way she’d instead cluck her tongue and gesture with her eyes towards me. “T-cha, T-cha,” she’d say, her warning that I should ignore her sporadic acts of discipline and keep reading. Besides my Hindi Teacher I made two very good friends in Vizag. A famous painter around 12 years older than I named V. Ramesh and a travel agent named Kip, who was just out of high school and a few years younger than me. Ramesh and I would go out every afternoon for fresh lime sodas or beers in one of the withered and worn out hotels that lined the city’s beach. A lot of Indian movies were filmed there, so we’d sit on the terrace and watch them rehearse dance sequences and dramatic, romantic scenes. I always hoped that if I hung around long enough someone on the film crew would ask me to be what they called a White Western Extra since once that happened to an American friend of mine. But no film crew ever asked. Not even when they filmed a lot of the exterior shots of a movie called “American Ahmaii” (i.e., “American Girl”) in Vizag on the beach. With Kip I’d go out practically every night and spend time with his family, an endless network of brothers and sisters and cousins and aunts all waiting to immigrate to Australia. Kip was an Anglo Indian so he couldn’t speak Telugu or Hindi nearly as well as me and all the women in his family wore dresses instead of saris and watched Beta videotapes of British soap operas played on a black market tape player hooked up to his Aunt Emma’s colour TV. I didn’t. Not after I met Jacob, anyway. He lived in the room directly below mine. At least, he lived there until around two or three days after we met, when he gave up his room to a computer science student named Amitava and moved in upstairs with me. Which, didn’t last very long. Only two of three weeks. 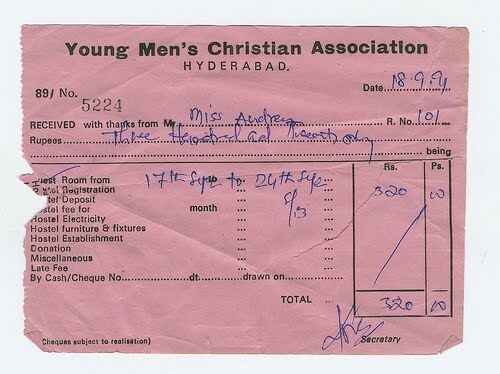 It was against the rules for an Indian to share a room with a Westerner, especially an Indian Boy with a Western Girl, so we moved to a little flat just underneath the Hyderabad Tank Bund, the only neighborhood in Hyderabad at the time where we could find someone who would rent a flat to a White, Telugu-speaking foreigner and an Indian, Urdu-speaking, Jew. Our landlord was a fallen Brahmin named Sunnil, who loved our love and let us use his hot water heater for free. He painted advertisements for the movies, dashing out 7 or 8 huge, 20 and 30 and 40 foot billboards each week. He’d copy images from photographs torn out of very old issues American and Australian Magazines and brand new copies of Bollywood Screen. Sunnil always made the American actresses look fatter than they were in the photographs adding an extra chin to Julia Roberts or flabby arms to Meryl Streep. “I have to make them look more like Indian Movie Stars or people won’t see the movie,” he’d explained to me while he worked, adding to Demi Moore’s head more hair, turning the short haircut she wore in the film Ghost into a long flowing mane. Every Thursday afternoon a team of boys would show up and carry the billboards away on their bicycles, hoisting them up high up into the air and then resting them flat upon their heads, balancing them as they rode away in tandem, as well practiced as any circus feat. And then, as if by magic, I’d see the billboard somewhere around town the next morning, Brooke Shields in Blue Lagoon, all tanned and glistening and fat, wearing a wet sari next to a billboard advertising Cadbury Fruit and Nut Bars, Marie Biscuits and other Commonwealth Sweets. It’s been over fifteen years since I left India and over fifteen years since I’ve been back, and even though I remember every detail of my time there, what I ate and what I read, the exact cost of different brands of Indian washing soap, the sweet smell of the bus exhaust, it never is a landscape in my dreams. It’s as if the night I said goodbye to Jacob at the Madras Airport and boarded the plane that flew me back to the West, I lost my footing and my sense of what this terrain felt like beneath my feet. Madras. Bancock. Honolulu. Seattle. Tampa. With every airport I lost a little bit more of the Indian I thought I had become and with every airport it became more clear to me who I was and would always be to this place, regardless of what I wore or who I liked or even loved, a White Western Extra, a White Western Guest. End Note: Since first writing this essay in 2005, I have gone back to India. Stories from those travels will appear here, in a future ‘It’s Not Rocket Science’ essay.